Two tiny particles colliding can cause a nuclear reaction. 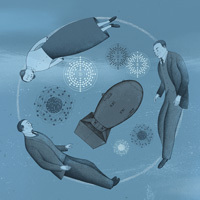 It is 1941, nations race to perfect The Bomb, and two scientists meet in occupied Denmark for a conversation that would change the course of history. Michael Frayn (Noises Off, Democracy) invites us to bear witness to the ultimate ethical impasse.